The lobby of the Royalton Hotel looks more like a runway, and is tres chic with several alcoves of pale leather banquettes and a gorgeous two-sided fireplace. The actual bar lies just to the right of the unmarked entrance, providing the perfect setting for New York professionals and European visitors to enjoy appetizers and drinks, noon and night. 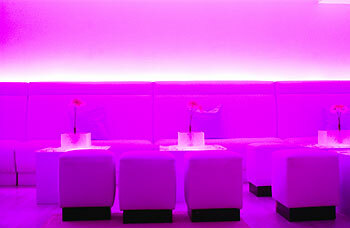 Bar 44 is the incarnation of Royalton's legendary round bar and offers the “art of lobby socializing” at its very best. If you are a wine lover you will love their cellar - it's got over 3,000 bottles. And if you get hungry after knocking back a few, the critically acclaimed Brasserie 44 restaurant serves outstanding and innovative American cuisine and is one of the hottest kitchens in town. Overlooking Fifth Avenue and the Pultizer Fountain, the Champagne Bar at The Plaza is reminiscent of the Champagne Porch that was in the same location when the hotel opened its doors in 1907. The most exclusive of the Plaza's dining venues, which once welcomed legendary figures including the Prince of Wales and Diamond Jim Brady has become a favorite destination of today's social set. By night, celebrate with the world's finest champagne, caviar and wines. You will feel like a princess. Or a prince. Unwind at the all-glass corner bar at Blue Fin. It is the perfect place to finish your day or start your night, in the heart of Times Square. Order the signature Blue Fin drink, garnished with a Swedish Fish and take a seat in a glowing resin barstool. If fruity drinks aren't your thing you can choose from an extensive 400+ bottle wine list. A more romantic atmosphere can be had at the second-floor bar, accessible from a floating staircase, where an extensive raw bar, sushi, and mostly seafood menu is available. End your night in the Piano Room, which offers live jazz bands nightly. The line outside and the overstuffed elevator ride are worth the trip to the 15th floor penthouse of the Hotel Gansevoort. As you exit directly into the bar area, the magnificent outdoor pool is on your left. Kick back and enjoy the scene at this richly landscaped roof garden and lounge area with breathtaking 360° city views. Plunge is filled to capacity on weekends with trendy twenty-somethings hoping to see and be seen. Go on a Monday or Tuesday night for a quiet (albeit expensive) drink, and enjoy the magnificent view in peace. This posh midtown hot spot, located on the top floor of the Peninsula Hotel is a favorite among New York’s business crowd. The glass-encased rooftop bar has a magnificent view and is a perfect hideaway from reality. Summer offers outdoor seating and an unforgettable New York experience. Enjoy the stunning views of 5th Avenue and Central Park, as well as midtown architectural gems like the Citicorp Center. If you get hungry go downstairs to the elegant Fives Restaurant, overlooking 5th Avenue, for authentic Atlantic Rim-Cuisine. In search for a great happy hour hangout? Katwalk, with its swanky ambiance, larger than life plasma screens and projectors is the place to go. Lovely young ladies tend bar and serve signature drinks like a “Katini” or appetizers like the spinach artichoke dip. Dim lighting, mirrors, candles, and warm-toned walls give off an intimate feel amid the cavernous room. The music is generally a mix of old and new, featuring 80’s, rock, top 40, classics and hip-hop. The food menu is an excellent eclectic selection of New American and Asian cuisines. Thursday nights are all about the ladies—so gather your BFF’s, sip a $6 cosmo, and mingle with the beautiful people from 3pm – closing. Want a quieter atmosphere? Try the upstairs dimly lit ‘Kat Lounge’ with its private bar and contemporary leather seating that beckons to sit back and relax in the company of friends. Happy hour is Monday through Friday, 11:30AM-7:00pm. It’s the Kat’s meow. Bookmarks carries on the theme of the Library Hotel in a plush setting, nestled among the collections of Dylan Thomas and Walt Whitman. With its breathtaking cityscape view, comfy upholstery, working fireplace, fully heated outside space during the winter months, a glass-enclosed patio, and an open-air terrace, you won’t be able to put this place down. Bookmarks gets crowded, so get there early and grab a seat. Nestle into this sprawling penthouse or the wrap-around terrace for a Great Gatsby, Capote, or Bookmark cocktail. Or just read a good book. The Campbell Apartment in Grand Central Terminal was formerly the luxurious office of 20’s railroad tycoon John W. Campbell. Campbell rented this large, amply windowed space in 1923 and transformed it into what was quite likely the most luxurious personal office New York City has ever known. When Campbell retired, he bought the magnificent space, just off Grand Central's west balcony, to satisfy a simple desire: to own the biggest ground-floor room in New York. This 20-foot-high fully refurbished space revives the lifestyle of that storied era and retains a virtual museum of details from its early incarnation. A monolithic safe sits within an enormous fireplace (it was once embedded in the wall), the original, colorfully painted wooden ceiling is spectacular, and Campbell’s enormous desk still dominates one side of the room. Considering the location, it's surprisingly homelike, and a perfect place to ignore the mayhem of mass transit outside. For a quieter setting and a fabulous view of the entire space, try the small balcony area that holds a pool table and can be reserved for parties. And don’t miss the jazz trio on Saturday nights. The Delancey is that rare breed—a shockingly nice rock club without the velvet-rope hassle. The main floor has a cool grotto vibe and a décor that's equal parts exposed brick and sleek wooden slats. During summer months, the rooftop is the main draw, with palm trees, and fountains and the views of the Williamsburg Bridge are unparalled anywhere else in the city. The rooftop garden is open year round and is fully heated and covered. A beautiful, comfortable oasis in any kind of weather. Some of the best young rock bands in the country have played at this three-level rock club. Crowds of band members and DJ’s squeeze into the tight but cool confines, with celebrities abound. This two-level pool hall is a trendy, modern alternative to the smoke-filled rat-traps of yesteryear. The lively contemporary bar area, with its luminous countertop and sunken lounge, is as smart as you'll find in Chelsea. Try one of the fancy house cocktails, like the 8-Ball (rum, Kahlua, Guinness and espresso), an unlikely concoction that's surprisingly good. Grab a cheese-stuffed burger and play a little pool. This hall is known for trendy comfort food in an untrendy setting.